Java is a highly portable language as it must be executed through a cross-platform compatible Java Virtual Machine (JVM).Furthermore, Android apps are also developed using Java since the Android Operating System runs on a Java language environment. Need Java help? Connect with our Java experts now! Generally, Java was designed to be relatively beginner-friendly in that it assumes the programmer is not that smart or careful, so programmers will be less likely to shoot themselves in the foot when coding Java apps. Java is a high level language, which means Java abstracts away (i.e. handles for you) most of the complex details of the machine (computer) such as memory management, etc. Thus, you can focus on programming instead of worrying about the little details many consider both tedious and difficult. Java is very stubborn and verbose, which means you need to write a lot of code trying to convince the language to build some feature. Thus, you may need to spend a lot of time coding before you can get a working app. This may be demotivating for coding beginners. Java is a statically-typed language, which means your code will have to be checked for errors before it can be built into an app. This means errors will be easier to track down. Furthermore, since statically-typed languages are also more strict with the definitions of things, you will have less strange and unexpected errors, which means your codebase will be easier to maintain as it grows in size and complexity. As a statically typed language, Java is faster than dynamically typed languages because things are more clearly defined. Thus, when the app is running, your machine's resources will not be wasted on checking the definition of something in your code. Modern Java programs are now even more performant thanks to mature JIT (just in time) compilers and improved JVMs, as performance can be optimized in real time to help a Java program run faster. This is very helpful as your app grows larger or needs to handle more processes. Community size is important because the larger a programming language community is, the more support you'd be likely to get. As you step into the programming world, you'll soon understand how vital support is, as the developer community is all about giving and receiving help. Moreover, the larger a community, the more people will be building useful tools to make development in that particular language easier. As of now, there are over 600 notable programming languages world-wide. So, with that context in mind, let's get into the details of the Java community size. StackOverflow is a programming Q&A site you will no doubt become intimate with as a coding beginner. Java has a huge community for both back-end web development and Android development. At meetups, you can generally network and learn from fellow developers. Meetups often offer mentorship to those who want it as well. There are over 1.4k Java Meetup groups, totaling over 580k members worldwide. In terms of programming languages, Java has the 4th largest meetup community. In general, the Java ecosystem is quite massive and mature, so there are plenty of good tools and libraries that will greatly ease the process of developing Java apps and learning Java in general. 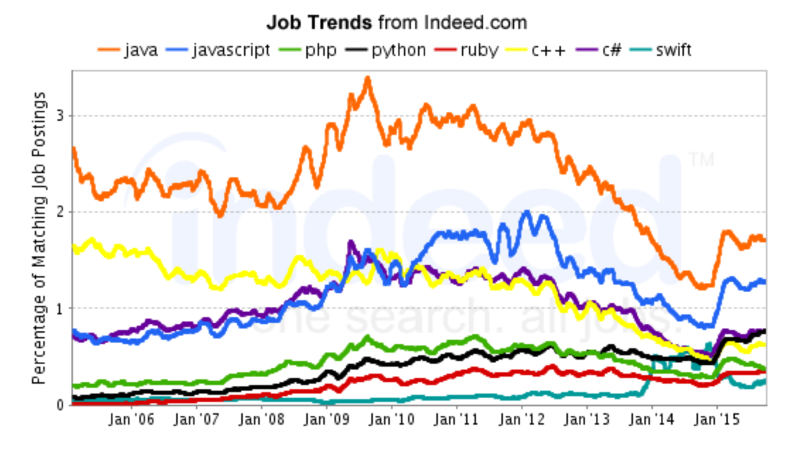 Java is the 3rd Most Demanded Skill on Angel list. Many tech giants such as Google or Amazon also use Java to develop the backend of their websites, and because Java has pretty good performance, a lot of startups who reach the scaling point would integrate their apps with Java to power features that need to have good performance. Java has a rather slow update cycle in terms of new versions to ensure backwards compatibility, and enterprises are also slow to adopt changes as well, so this works out fine for both parties. Oracle owns Java so the language is actively worked on to stay relevant, and bugs are fixed relatively quickly. Although Java has been criticized many times and many languages have tried to replace it as a better Java, with the release of a better Java (Java 8) during March 18th 2014, Java will clearly continue to stay relevant and will be going strong, especially since it already has many mature tools and libraries that will not be easy to replace. A programming language's ability to stay relevant and survive also depends on whether the language is getting new blood, so clearly Java will continue to dominate in the years to come. What is the best programming language for me?